Sometimes the best solution to a problem is one that we create together. Preventive law is a core value at Weissman. While litigation is sometimes necessary, it can be costly for all involved. Because we realize the importance of solving problems in a timely and cost efficient manner, we offer our mediation and arbitration expertise to our clients. We also serve as neutrals for disputes involving outside parties. Weissman is one of few law firms with a predominant background in real estate matters offering arbitration and mediation services. Our attorneys bring a unique perspective to the negotiating table as a result of extensive experience in real estate proceedings. With a litigation practice highly regarded for its success and trial experience in the real estate arena, we understand the intricacies of issues our clients face. Our alternative dispute experience is not limited to real estate matters. Our attorneys have successfully mediated and arbitrated cases dealing with personal injury, contract and commercial disputes, and insurance issues, among other areas. Our team of alternative dispute resolution attorneys bring over 70 years of experience in successful alternative dispute resolution cases that encompass all ranges of complexity. Successful mediation and arbitration include not only working to understand both sides of the issue, but also understanding the individual parties involved in the dispute and their motivations and concerns. 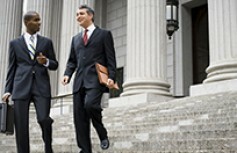 Our attorneys recognize all disputes are unique and we work with the involved parties on a personal level to open communication and promote a quick and clear resolution. We know the process and we partner with the parties to achieve results. Weissman offers efficient resolution by experienced attorneys. We encourage mediation and arbitration as preferable methods of dispute resolution to ensure quicker, more cost efficient solutions and to preserve relationships of parties involved. Weissman attorneys will be your partner in reaching a favorable outcome. Mediation is an attempt to resolve a dispute among parties with the help of a neutral third party. The mediator is a facilitator who keeps the dialogue open and may offer suggestions for possible ways to come to a mutually agreeable solution. The ultimate decision as to the final resolution of the dispute remains with the parties. Because mediation is confidential and private, options and solutions can be identified in ways not readily apparent in adversarial settings. Disputes in arbitration are submitted to one or more impartial individuals for a final and binding decision. The parties control the range of issues to be resolved, the relief to be awarded as well as many procedural aspects of the process. The arbitration hearing is private and less formal than a trial. It also utilizes experts in the areas of dispute as opposed to a judge and jury who may not be familiar with the issues and the law. The arbitrator's decision or award is made in writing and is enforceable in court under state and federal statutes.